The core of the technology is the proprietary Self-Heating Single Flow Vortex Pressure Reducer (VPR) capable of making a non-freeze pressure cut of non-preheated gas. In the VPR, high pressure gas expands in the unit’s tangential nozzle of a fixed size down to the delivery pressure. While in the VPR cylindrical part, the rotating low-pressure gas undergoes energy division (vortex phenomenon), forming two currents: cold and hot. The currents coexist in the VPR and exit the unit through a single discharge orifice. Prior to exiting the VPR the hottest portion of the hot flow is internally directed to warm up the unit’s inlet nozzle (self-heating provision), thus preventing the inlet depressurized flow freeze up. The vortex cold and the hot flows mixing up at the VPR discharge negate their temperature differences. Therefore, the temperature of the combined flow at the VPR single discharge reflects only Joule Thomson temperature drop in the expanded gas. The VCS_CNG design takes advantage of the low temperatures available at the VPR unit’s discharge by chilling the compressed gas as it fills the portable CNG tanks. The CNG filling system consists of three compressors delivering total 3,600 scfh at maximum outlet pressure of 3,700 psi. Pipeline gas compressed via existing compressor array is directed to fill in portable daughter CNG tanks. As the gas pressure in the CNG tank increases, the gas temperature increases as well; the warmed, expanding gas creates back-pressure that eventually exceeds the maximum filling pressure. To efficiently cool down the gas in the CNG tank, the gas from the compressor discharge is periodically directed to the VCS, which is designed for total capacity of 3,600 scfh at 3,700 psi. 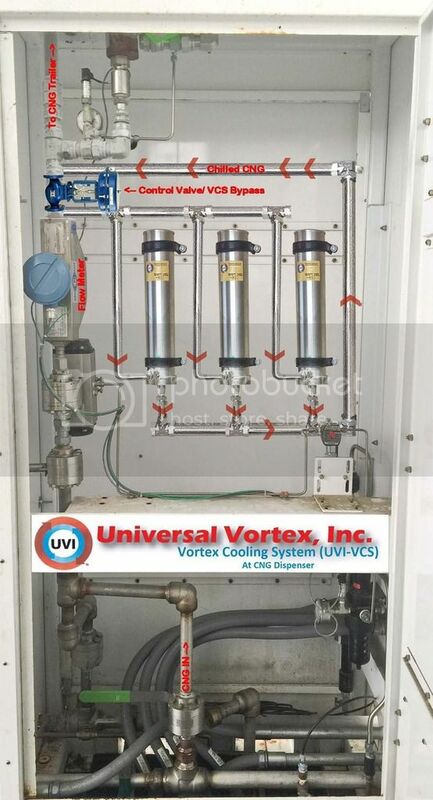 In the VCS, the gas undergoes non-freeze pressure reduction in VPR unit(s) from 3,700 psi to the current pressure in CNG tanks; accordingly, its temperature drops due to Joule-Thomson effect in the expanding gas. The cooled gas mixes up with the gas presently in the CNG tanks. *At lower ambient temperatures the gas temperature at the VPR discharge will decline proportionally. At filling station with the VCS retrofit the existing chiller (if any) can be turned off at moderate and low ambient temperatures (e.g. most of the time) thus saving the operational cost. The VPR operations will stop and direct compression will resume when temperature of the accumulated gas in CNG tanks reaches a certain specified “low” temperature. Accordingly, when the tanked gas temperature increases, the process will again turn to VPR. At a tank pressure above 2,700 psi, the ratio of VPR inlet and outlet pressures (the unit driving force) become too small to generate enough heating duty to efficiently warm up the unit’s inlet nozzle. Therefore, the gas at the compressor’s discharge bypasses the VPR and goes directly to the CNG tank.